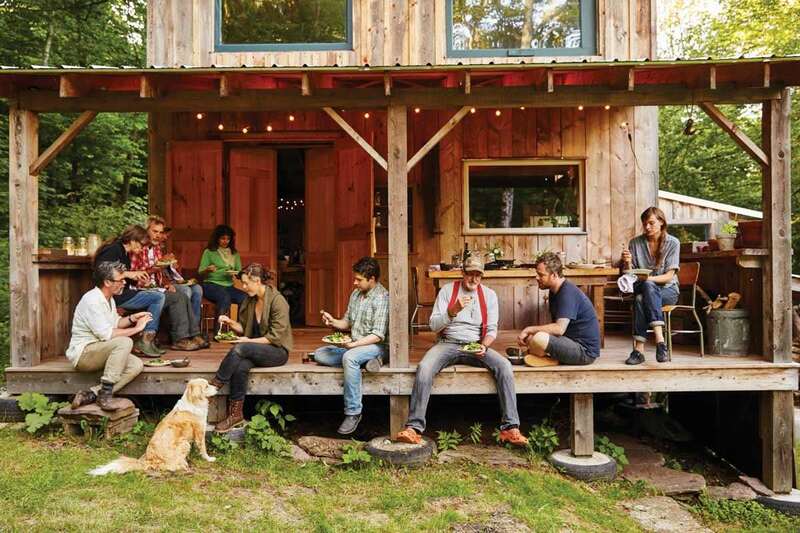 Inez Valk left Brooklyn for a backwoods parcel way upstate - then built a life around it, opening a restaurant that turned area farmers into friends. The gang, digging into dinner on the back porch, included (from left): Inez Valk's neighbor Julian Richards, Susan and Walter Riesen of Star Route Farm in Worcester, Dan Finn of Bovina Valley Farm in Delhi, herbalist Marguerite Uhlmann-Bower, Tianna Kennedy of Star Route Farm, Brooklyn restauranteur John Poiarkoff, Steve Burnett of Bovina Valley Farm, restauranteur Carver Farrell, and Valk. 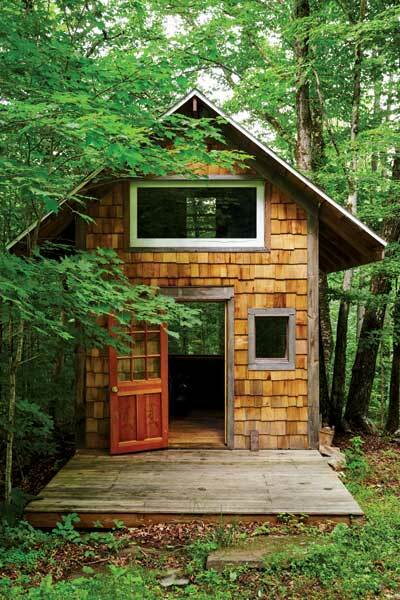 Her 600-square-foot cabin sits deep in the Catskill Mountains, about a 10-minute drive from the Middle of Nowhere – otherwise known as Bloomville, New York (population 213) – at the very end of a winding road appropriately named Dancing Street, given the way cars jump and wiggle along its rough terrain. Brooklyn? That can require a four-hour commute. “This is a very unlikely place for a young person to live,” admits the 33-year-old Netherlands native. Especially a single young person. 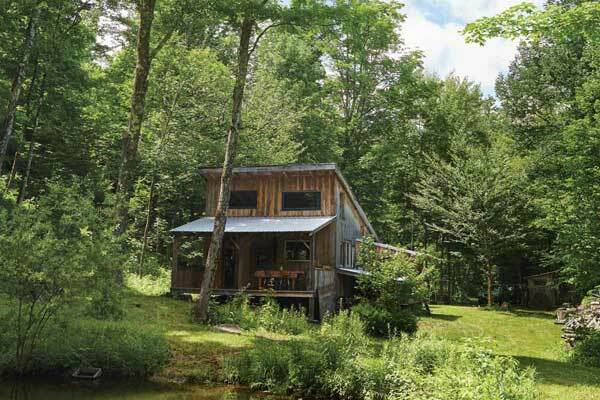 In 2008, Valk and Kempthorne scored five acres in Delaware County that met their criteria: cheap, remote, and with a pond. The two spent the following summer living in a teepee while constructing their future home by any means available. 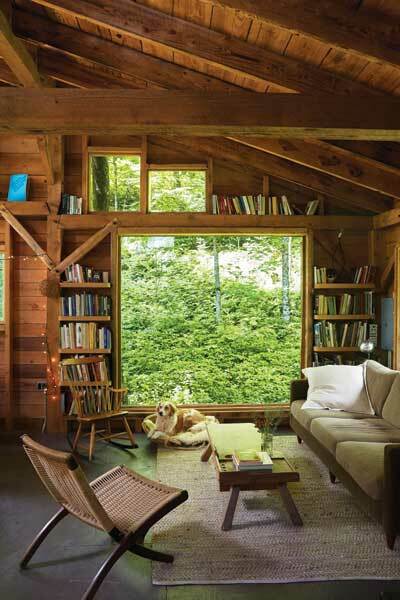 Windows were salvaged from a soon-to-be-demolished gas station. Scrap lumber was cleaned up and transformed into walls. 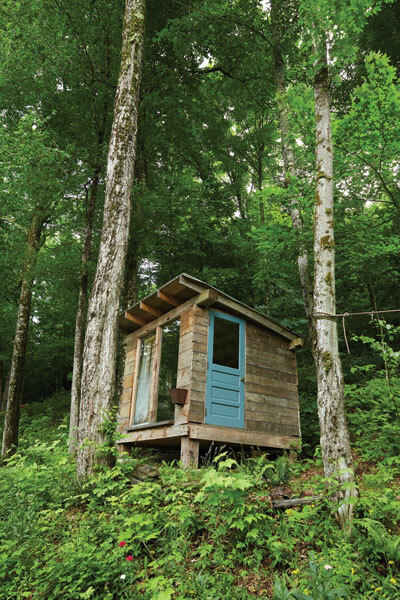 Valk’s 600-square-foot cabin, just outside of town, was built from scrap lumber and salvaged windows. 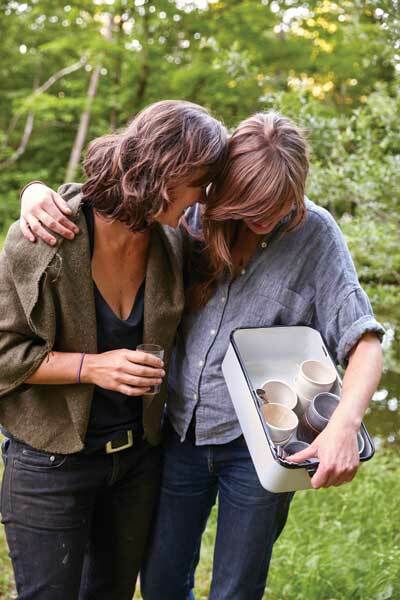 Inspired by her friends Emily and Melissa Elsen – the South Dakotan sisters behind Brooklyn’s destination pie shop Four & Twenty Blackbirds – Valk envisioned her next chapter in a neglected former boardinghouse at the intersection of Bloomville’s sleepy River Street and Route 10. Today, Valk’s laid-back restaurant, Table on Ten, serves familiar, down-to-earth fare – salads, sandwiches, and pizzas – elevated by extraordinary ingredients. 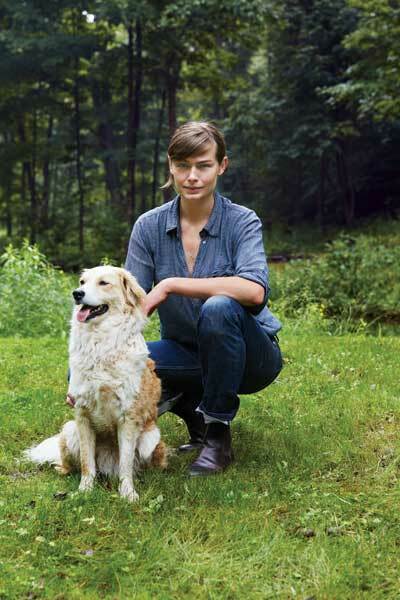 She gets raw-milk cheese and pasture-raised pork from nearby Bovina Valley Farm, heirloom lettuces grown some 20 miles away at Star Route Farm, and eggs laid by cage-free hens at Bloomville’s own Byebrook Farm. Bon Appétit, Travel+Leisure, and Vogue have taken notice, bringing national attention to what had essentially become a ghost town. Valk’s priorities, however, remain resolutely local. She encourages community organizations to use the space for events and regularly hosts foraging workshops led by area herbalist Marguerite Uhlmann-Bower. 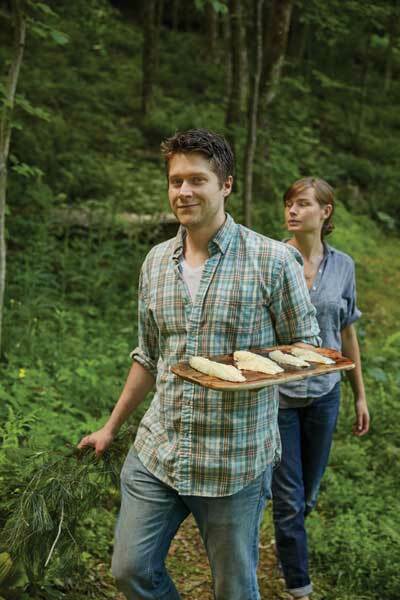 If a neighbor wanders in with garden surplus, Valk has been known to incorporate it into the day’s menu. Herbalist Marguerite Uhlmann-Bower (far right) helped Valk and her Brooklyn-restaurateur friends (from left) Carver Farrell and John Poiarkoff forage the surrounding woods for greens and herbs. 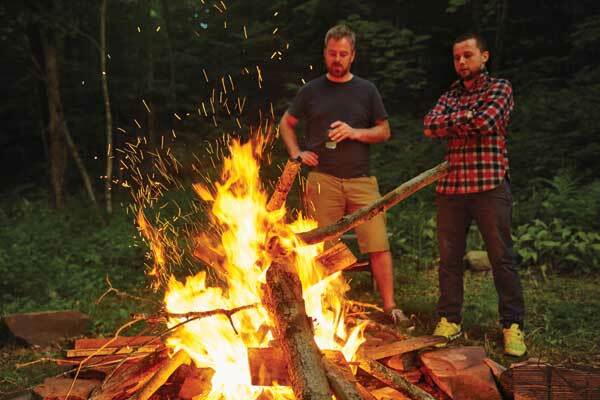 Farrell (near right) and his coworker Evershed Mattingly catch up around the bonfire. 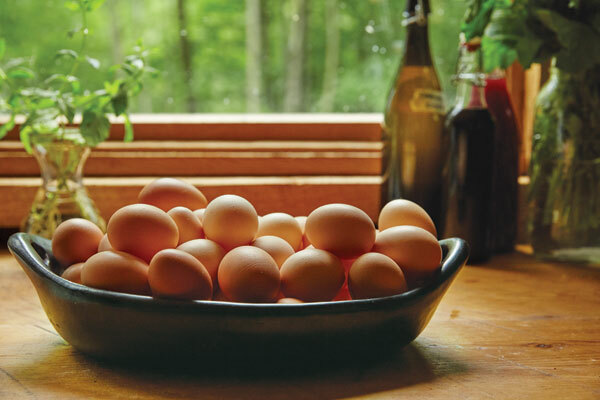 Bloomville’s own Byebrook Farm supplied eggs for the meal. 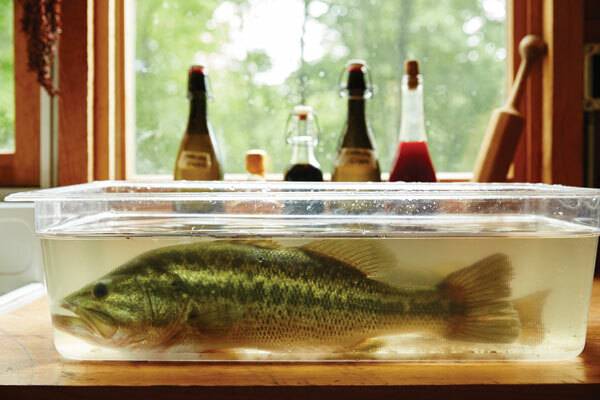 A container filled with pond water kept this bass, caught by area farmer Steve Burnett, fresh for hours. 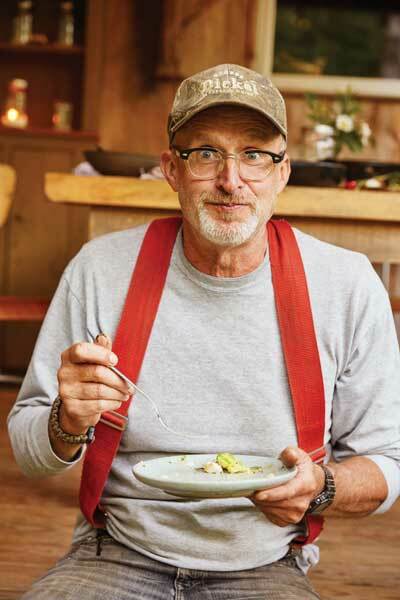 As a way of thanking her purveyors, the restaurateur recently hosted an intimate dinner that she dubbed the “Dancing Street Summit.” Burnett arrived with a freshly caught three-pound bass that Valk and his pal Jonathan Poiarkoff, chef at Brooklyn’s The Pines and Willow, grilled and tossed with hard-boiled Byebrook Farm eggs. Uhlmann-Bower foraged stinging nettles from the surrounding forest for a sophisticated soup topped with dollops of ricotta made with Bovina Valley Farm’s heavy cream. Riesen contributed chicory, fennel, and heirloom lettuces for a series of salads. Even the party’s small-batch bourbon, corn whiskey, and absinthe boasted a local pedigree, courtesy of Delaware Phoenix Distillery in Walton. The group enjoyed the meal the way good friends do – buffet-style, plates on laps, at whatever back-porch perch seemed most comfortable – before swapping stories around a roaring bonfire. 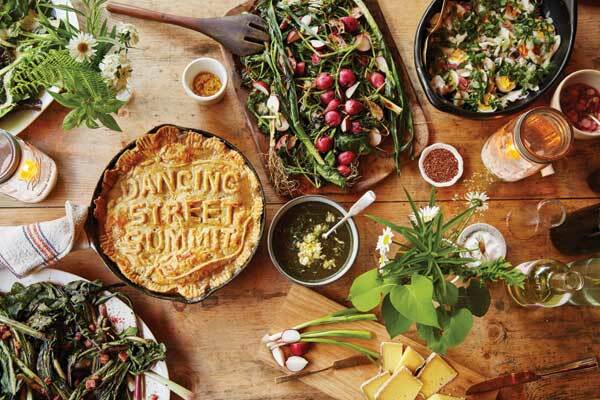 Valk titled her dinner party the “Dancing Street Summit” after the winding road to her cabin, then spelled out the message atop a savory rabbit pot pie. The spread also featured (clockwise, from bottom left) grilled chicory with bacon vinaigrette, radish salad, and grilled bass with hard-boiled eggs. Valk rescued her female mutt, Ollie, from a local shelter. The chef shares a laugh with Kennedy. 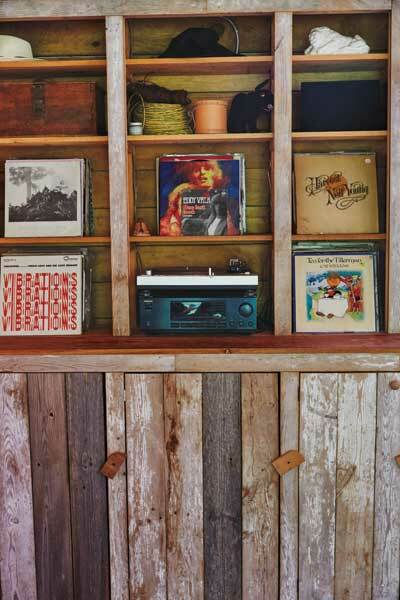 One of the two guest cabins on Valk’s property is clad in reclaimed wood. Insulating the cabin’s exterior walls allowed Valk to leave the framework exposed inside. 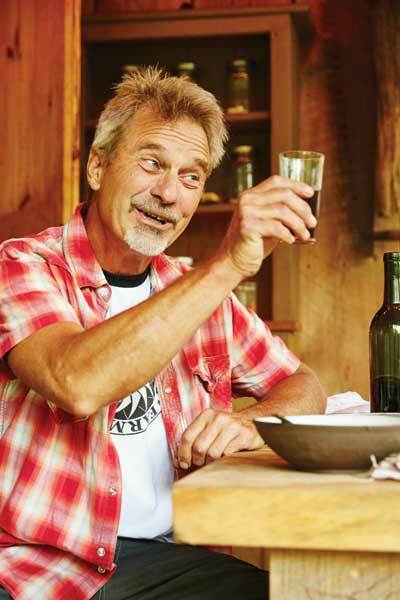 Steve Burnett grows organic fruits and vegetables in nearby Bovina. 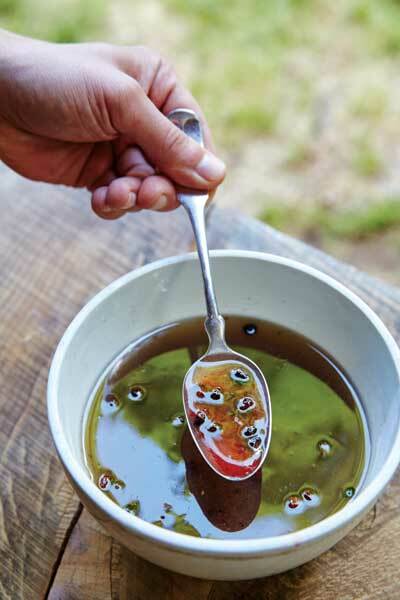 Valk paired this vinaigrette, which includes autumn olive berries and bacon fat, with grilled chicory. 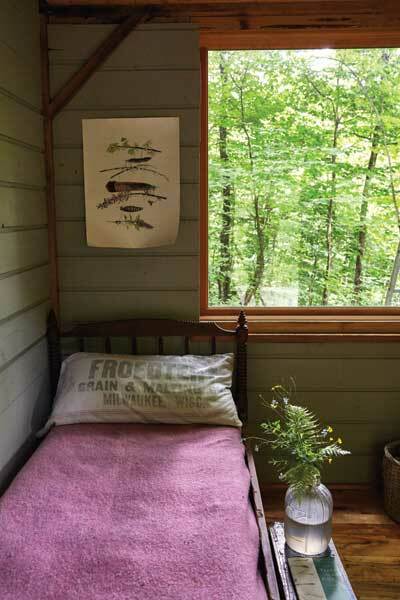 A grain-sack pillow and simple wool blanket dress a guest-cabin bed. Poiarkoff and Valk ferry the filleted fish to the grill. 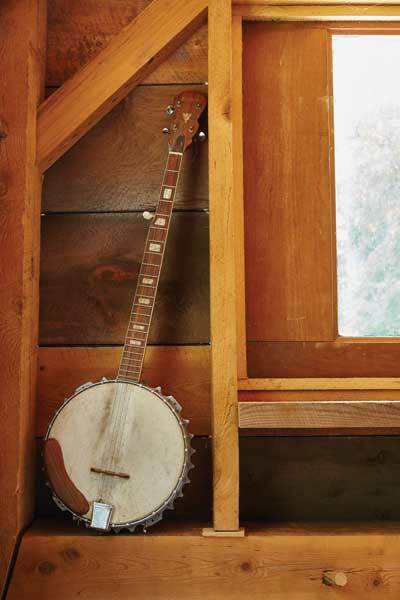 An old banjo awaits a willing musician. Cedar shingles adorn Valk’s second guest cabin. Walter Riesen raises a toast. A 45 by Valk’s father, Eddy – whose song “One Last Look” was a European hit in 1980 – sits above the turntable. 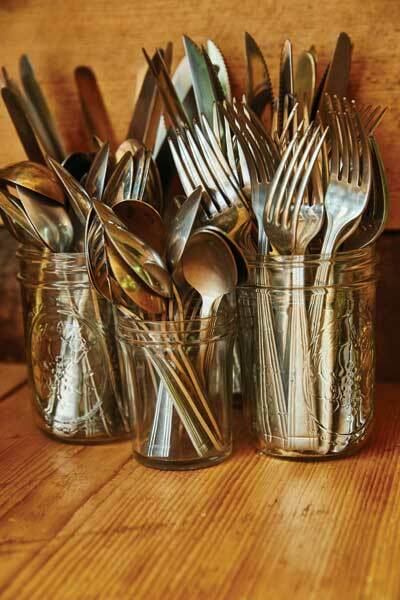 Valk stores flatware in guest-friendly mason jars, not drawers. 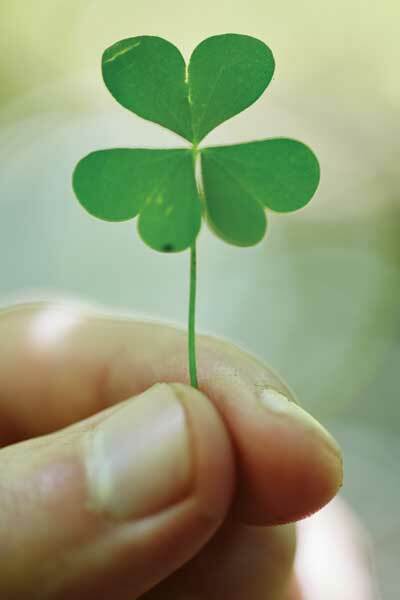 What’s luckier than a four-leaf clover? Finding citrusy wood sorrel in your forest.